I got a new toy over the weekend. 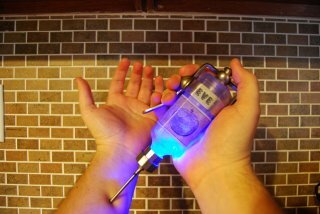 It’s a replica EVE Hypo from Bioshock. I was disappointed after first pulling it out of the box. 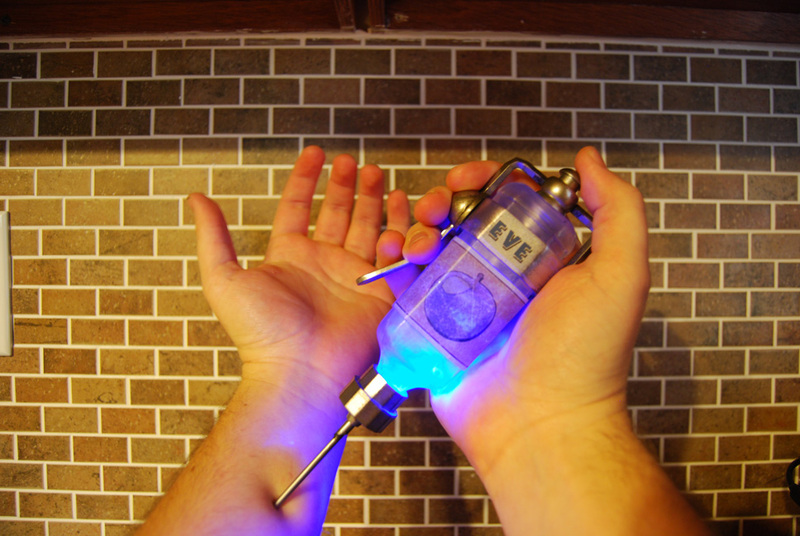 The needle fell off and the blue LED inside didn’t light up. But after gluing the needle back on and wiping some corrosion off the batteries it looks and works great. My mom and sister usually go to the Highway 127 Yard Sale every summer. I’ve only gone along with them once. I just don’t have the desire to look through other peoples’ junk in 90+ degree weather. But, being that I recently took up the hobby of record collecting, I decided to go with them Saturday to see what I could find. While looking at a table full of old fishing lures in Dunlap, I heard the unmistakeable siren of Ecto-1 in the distance. I assumed someone nearby must have had some Ghostbusters toys for sale, so I looked around to see where the sound was coming from. The siren kept getting closer. 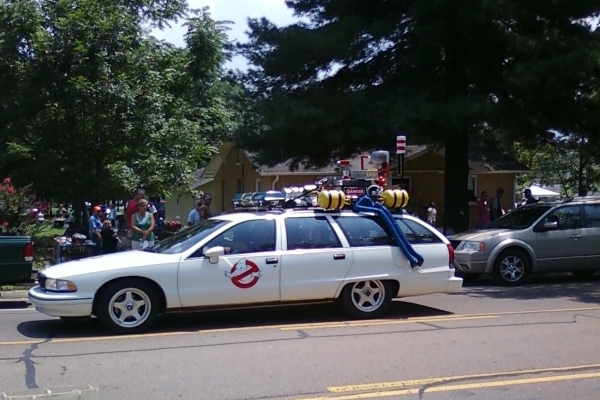 Then I saw this station wagon rolling down the road. We saw it again a few hours later around Pikeville. This time it was blasting the theme song. I’ve been getting free stuff online for at least 10 years. 2008 definitely tops the list for my biggest haul. I’m a few weeks late at getting this posted, but here’s the pumpkin I carved of my dad’s dog Jack for Halloween. I made the stencil using GIMP. It looked pretty good all lit up, but I forgot to get a picture of it. I got an email this morning from Netflix. Seems that I have finally received my benefit from the Chavez vs. Netflix settlement. Took long enough. I originally posted about this back in November of 2005. This afternoon I received another email stating that I won fourth prize in the XBox Live GTA IV Sweepstakes, a whopping 1000 Microsoft Points. That’s approximatley $12.50. As you may recall, I had some issues with my cable several months back and was so disgusted with the service that I had it canceled all together. It was tough in the first few weeks, but since then I’ve actually coped with the lack of cable surprisingly well. I pick up all the local channels (in HD) with an antenna, and I download a few cable shows off the internet. I’m moving out this weekend, and have most of my stuff packed up right now. As I was getting some stuff together in the bedroom, I decided to plug in the small TV I have in there to see what was on. I had already packed up the antenna, so the reception wasn’t very clear. Looking behind my dresser, I found a length of coax that had been abandoned after I ditched my cable. It was still attached to the wall jack. I attached the other end to my TV to see if it would give a slight improvement in reception. To my surpise, the picture was incredibly clear. I started flipping through the channels, each one as clear as the next, when I noticed some channels showing up that I can’t get over the air. I have free cable! I guess the cable guy must have messed up the wiring when he was performing the installation for my new neighbors, and unknowingly supplied me with cable. Who knows how long I had this and didn’t even realize it. I can’t even enjoy it because I’m leaving tomorrow. I may be even more upset over this than I am about getting laid off. I haven’t been sleeping well lately. Typically, I’m in bed by 11:00, but I’m lucky if I’m asleep by 1:00. On nights when I do fall asleep quickly, I usually wake up sometime in the night and can’t get back to sleep for at least two hours. Friday morning, for example, I woke up around 4:30 and finally got back to sleep about 10 minutes before my alarm went off at 7:15. I try to catch up on weekends, sleeping until about 10:00. It didn’t help that we lost an hour last night. I have a feeling that this time change may make things even worse.